Should you go into campus? 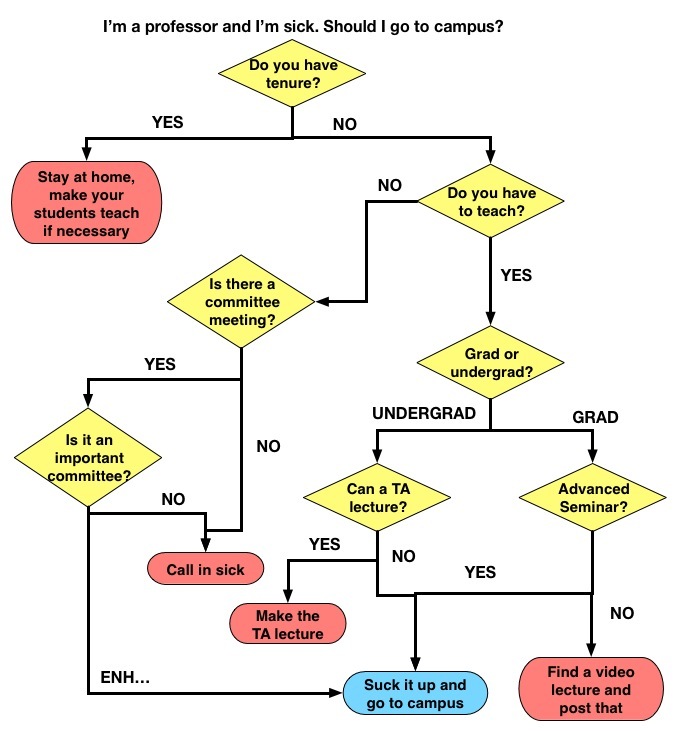 Since I’m sick and I can’t really focus on math right now, here’s a flowchart to help you decide if you should go into campus. Setting: a lone house stands on a Scottish moor. The fog is dense here. It is difficult to estimate where your foot will fall. A figure in a cloak stands in front of the door. Figure: [rapping on the door, in a Highland accent] Knock knock! Voice from inside: Who’s there? The deadline for this special issue is coming up soon! Aims and Scope: There has been a remarkable increase in the usage of communications and information technology over the past decade. Currently, in the backend and in the cloud, reside electronic repositories that contain an enormous amount of information and data associated with the world around us. These repositories include databases for data-mining, census, social networking, medical records, etc. It is easy to forecast that our society will become increasingly reliant on applications built upon these data repositories. Unfortunately, the rate of technological advancement associated with building applications that produce and use such data has significantly outpaced the development of mechanisms that ensure the privacy of such data and the systems that process it. As a society we are currently witnessing many privacy-related concerns that have resulted from these technologies—there are now grave concerns about our communications being wiretapped, about our SSL/TLS connections being compromised, about our personal data being shared with entities we have no relationship with, etc. The problems of information exchange, interaction, and access lend themselves to fundamental information processing abstractions and theoretical analysis. The tools of rate-distortion theory, distributed compression algorithms, distributed storage codes, machine learning for feature identification and suppression, and compressive sensing and sampling theory are fundamental and can be applied to precisely formulate and quantify the tradeoff between utility and privacy in a variety of domains. Thus, while rate-distortion theory and information-theoretic privacy can provide fundamental bounds on privacy leakage of distributed data systems, the information and signal processing techniques of compressive sensing, machine learning, and graphical models are the key ingredients necessary to achieve these performance limits in a variety of applications involving streaming data, distributed data storage (cloud), and interactive data applications across a number of platforms. This special issue seeks to provide a venue for ongoing research in information and signal processing for applications where privacy concerns are paramount. Prospective authors should visit the JSTSP website for information on paper submission. Manuscripts should be submitted using Manuscript Central. I’ve been in a non-blogging mode due to classes starting and being a bit overwhelmed by everything, but the news came out today that Microsoft Silicon Valley is closing. Although the article says that some researchers may find new homes at other MSR campuses, it’s not clear who is staying and who is going. As with all of the recent industrial research lab closures/downsizings, my first thoughts are to the researchers who were working there — even if one has an inkling that things are “going bad” it still must be a shock to hear that you won’t be going to the office on Monday. Here’s hoping they land on their feet (and keep pushing the ball forward on the research front) soon!